And I am generally quite proud of my friends and followers because they don’t back down from a good discussion, and because they mostly proceed with civility and respect. I am further proud of them because of the diversity they represent in every form. As a collective body, I often refer to them as my “Prius with a gun-rack” because they represent the whole spectrum of modern political and religious beliefs. I always start with definitions: dictionary definitions and personal definitions. 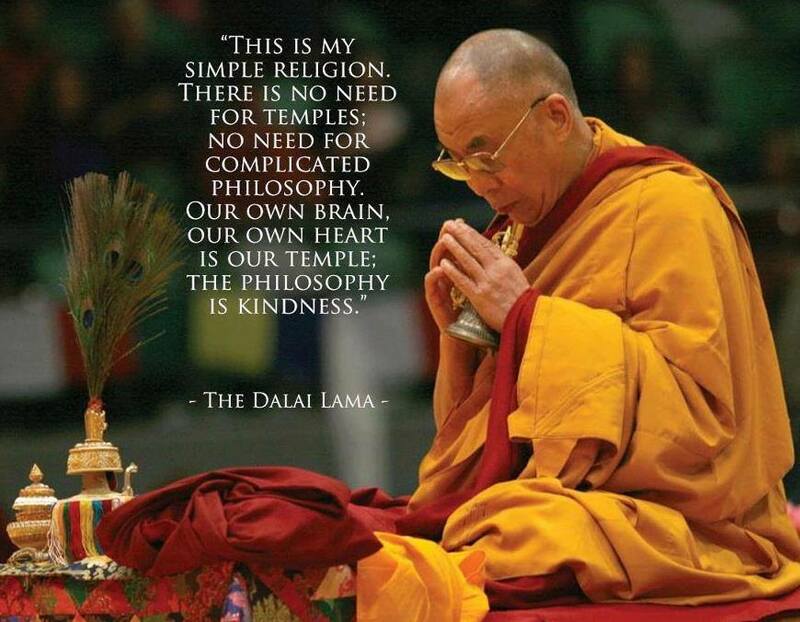 I am blogging a more thorough reflection and examination of this quote, but for now I invite you to consider definitions of the words “religion” and “kindness.” What do those words mean? What do they mean to you? What might they mean to HH the Dalai Lama? For now, I also offer King David’s psalm in which he says to God, “Thy loving-kindness is greater than life,” (Psalm 63:3) remembering that this was written/prayed during the time of the Law, and before Christ. And now I deliver on that promise. I have been pondering this for days now, and I have come to realize that every one of my friends is religious by this definition. Those highly committed to climate change response, those proactive in the LGBTQ community, atheists, Christians, Muslims, scholars…all of them are religious in that they adopt a “specific fundamental set of beliefs and practices.” And they all proselytize. When I first read and posted the Dalai Lama’s quote, it was not my impression that he was referring to notions of salvation or eternal life. And I would further argue that one does not gain access to those things because of “religion” or “fundamental beliefs.” Those miracles are far beyond the confines of religion, in my estimation. But by transcending (to rise above or go beyond; overpass, exceed) the box of religion, we reach places which eyes have not seen and ears have not heard. Perhaps the Dalai Lama’s quote is meant to undo the chains of ritual and piety, and invite us to “proceed from benevolence.” To be kind. I will close with one last definition of “religion”: the Bible’s. Sounds like kindness to me.